Tire stretch is a divided subject across the car enthusiasts world with one side declaring it as a death trap and the other claiming that it makes no difference. Rewind 20 years and you would have probably never seen tires stretched in such a way but it has become extremely popular over the last few years. The main reason car owners will stretch their tires is to allow the wheel to fit without touching the arch. The stretched tire will allow for a lower offset or larger width of the alloy. 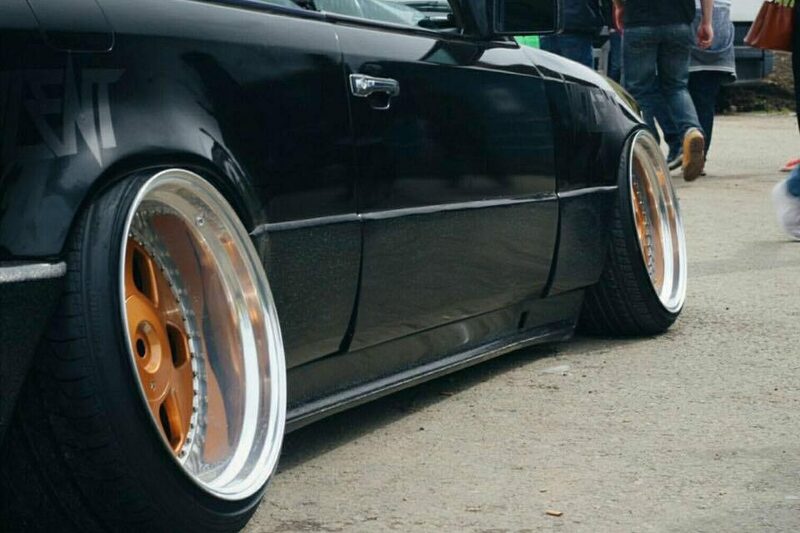 The end result is the “hellaflush”, “slammed” or “stanced” look that is given to cars that are lowered with stretch tires. There is zero performance benefits from stretching your tires. The benefits are purely for appearance and saving your arch from damage. If you were going for performance, the wider the tire tread, the more grip your car will have on the road. 1 Are Stretched Tires Safe? 2 Is Tire Stretching Legal? This is a hugely controversial subject in the car enthusiasts/modification world with arguments on both sides for and against stretched tires. 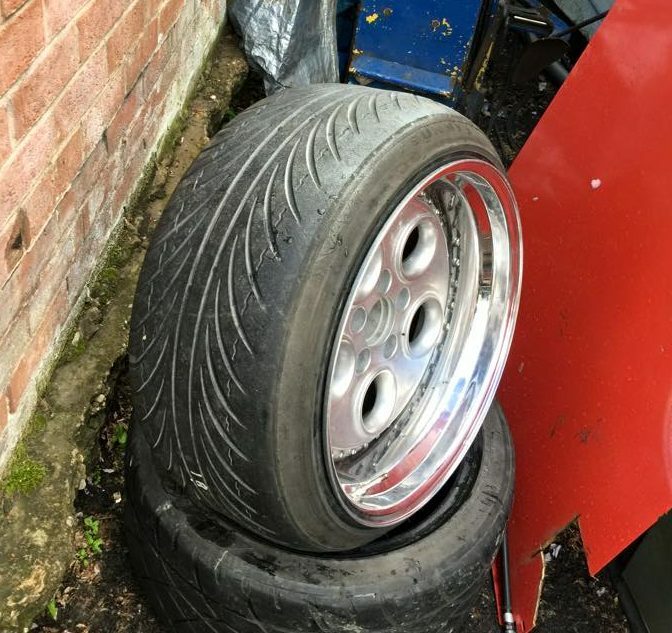 I personally have run tire stretch for many years on previous lowered cars with zero issues but there are many horror stories from other enthusiasts. Below are reasons why stretched tires are safe and why they are not. The modern tires are much thicker than they were a few decades ago and with the correct air pressures within the tire, there is no risk of the tire popping off the bead. It is common practice that if you run stretched tires, you must use a higher PSI than standard. Therefore, it is always handy to have a tire inflator nearby for those running stretched tires. There is such thing as a “Safe Stretch” and “Excessive Stretch“. The latter would be safe as the sidewall becomes completely deformed and the rim sticks out of the tire by a few centimeters and personally just looks stupid. Some modern car manufacturers are even performing safe stretching of tires. An example that I saw the other day is a 2011-2015 Mercedes E Class (W212) that was running 19 inch tires but with a moderate amount of stretch. Therefore, moderate tire stretch would be deemed as safe but if you take it too far with excessive stretch, then it would be dangerous with heavy usage. Below would be an example of excessive stretching of a tire. The majority of non car enthusiasts will agree that tire stretch is not safe. Modifying the tires so that they fit your car is not ideal and it will cause adverse handling as well as the potential of the tire popping off the bead whilst taking a corner. The reduced tire grip on the road will effect the stopping as well as effecting the wear pattern. Excessive stretching of the tire will also get damaged much more easily from road objects and the dread curb as there is no protection. Excessive stretch will not only be deemed as dangerous but it is also not legal is many countries around the world. Tire stretching is a grey area in terms of legality but the fact of the matter is excessive stretching of the tire is dangerous and the deformed sidewalls can cause all sorts of handling/driving issues. The legality surrounding tire stretching is a “grey” area that is hard to prosecute because there is no exact law. It varies from state to state where in the UK, if it is deemed as unsafe, you will be forced to retake an MOT test. It is known to be banned completely in Germany and varies from state to state in the US. On whether they are legal or not, your car insurance may void your policy if they are not informed of your tires. Even if you do inform them, they may even decline your modification and refuse to insure your car with that modification. All tire manufacturers will have a size chart for each tire size to match the width of the alloy. Try and stick to their thresholds for peace of mind in terms of legality and your car insurance. When I have run tire stretch previously, Falken were the go to tires and even stated types of stretch that was safe. Check the tire stretch guidelines for Falken tires here (Page 8+). If you want to run Nankang tires, they also have their own guidelines. For those that are completely new to stretching tires, it is worthwhile checking out the different types of tire stretch. The website known as tyrestretch.com allows you to do exactly this and there are some crazy stretched tires on show. The purpose of the site is to allow users to submit their stretched tires and then visitors of the site can search the width, profile and diameter of a tire to see what it looks like. You can view further statistics from the website here. Tire stretching may not be to everyone’s taste but here are alternatives if you have lowered your car. The first involves modifying your arches using a fender roller to flare the arches to give you the few extra inches clearance. If this is still not working, you can go to the extreme of widening the arches with a body kit but this would be after heavy consideration. However, personally if this is the case, you have either lowered the car too much or purchased the wrong wheels. The subject of stretched tires will always have a divided opinion. However, having personally run stretched tires over the years, it is a matter of whether you want a car for performance or aesthetics. Hopefully the guide to stretched tires above has provided you with the knowledge to make your own decision on whether to stretch your tires.